Norphlet Middle School gifted and talented students raised $140 to defeat childhood cancer by running a lemonade stand during Parent Teacher Conferences. What is Alex’s Lemonade Stand Foundation? Alex's Lemonade Stand Foundation (ALSF) emerged from the front yard lemonade stand of cancer patient Alexandra “Alex” Scott (1996-2004). At the age of 4, Alex announced that she wanted to hold a lemonade stand to raise money to help find a cure for all children with cancer. Since Alex held that first stand, the Foundation bearing her name has evolved into a national fundraising movement, complete with thousands of volunteers across the country carrying on her legacy of hope. 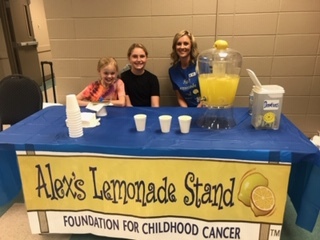 To date, Alex’s Lemonade Stand Foundation, a registered 501(c)3 charity, has raised more than $150 million toward fulfilling Alex’s dream of finding a cure, funding over 800 research projects nationally. Alex is the inspiration behind Alex’s Lemonade Stand Foundation. Alexandra “Alex” Scott (1996-2004) was diagnosed with neuroblastoma, a rare form of childhood cancer, before her first birthday. At the age of 4, Alex announced that she wanted to hold a lemonade stand to raise money to help find a cure for all children with cancer. What is Alex’s Lemonade Stand Foundation’s mission?